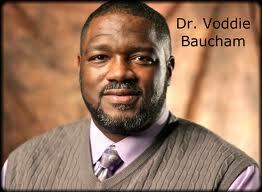 Voddie Baucham: The sort of injection of race into [Elephant Room 2]; and intentional use of race in this regard is sinful. James White: How has that happened, as you see it? Baucham: (pause) In a number of ways; not least of which, is (pause) these kinds of discussions that are taking place and using black people (pause) to (pause)justify what happened with T.D. Jakes in that room. Baucham: And irony of ironies, these guys thought he did well on the Trinity; they thought he was orthodox on the Trinity—and one of them even pointed to the fact that he referenced 1 Timothy 3:16. And he alluded to the fact that really helped him understand Jakes better. When those of us who have dealt with modalism (White: Mm-hmm.) from an apologetics perspective (White:Mm-hmm.) knows that, that was actually the smoking gun. Baucham: That was not something that should have made brothers sit in that room and go, “Wow, I never thought about that.” It should ahve been something that make brothers sitting in that room go, “Whoa, whoa, whoa, whoa, whoa, he just went back to it [modalism]. Baucham: “He just went back to it.” It’s so ironic that we, you know, move away from these issues of first importance; and by the way, one of the other problems is that the real issue. Let’s just say that the brother—let’s say the brother’s trinitarian. Ok? Let’s say he’s confused; let’s say, you know—as brilliant as he is—all the things he’s been able to write—all the, you know, as advanced as he’s been able to become in all of these areas of his life. By the way I— (laughs). This is another thing that’s ironic, is that—one of the most racist things that you can do—is actually say that black people get a pass (pause) on theology, and they get a pass on, you know, things like—I don’t know—Titus 1:9 and the duties and responsibilities of a pastor, as it relates to his doctrine and theology, simply because they’re black. And because of the way that they were raised; and the context that hey were raised in. But that is the height of disrespect. But let’s just go ahead and say that, he’s trinitarian; he’s moved away from modalism, he’s orthodox in his view of the Trinity. He just, you know, doesn’t really know how to express it well. That brings up two questions. Number one: If that’s the case and you respect him, then take care of that in private. Help him, and disciple him. But number two: What about the Word of Faith, prosperity gospel? White: So, now what I’m hearing from you right now, interestingly enough, the issue—see—the first place that I saw race brought up was in the Loritts’ blog, when it talked about “white middle-aged reformed guys.” And, I’m hearing you saying, you’re seeing it—in its fullest expression—in essence, the misuse of three black pastors as a mechanism of defense for what took place [in ER2]. And yet it’s interesting—a lot of folks in listening to that have heard statements that sounded like some of those pastors—I think specifically Bryan Loritts—were basically saying, “Well, I think there are some black pastors out there that want to have a wider audience, and so they’re sort of ganging up on Bishop Jakes.” So, it sounds like there’s multiple different streams coming all together and creating a massive amount of confusion; depending on how we’re listening and how we understand what the motivations were behind the person speaking. Baucham. Yeah. This is wrong on so many levels. It is absolute—it’s poison; it’s like a cancer. And it has metastasized now. And this is just the latest expression; and it’s grieveous. What’s ironic is—that in the midst of all of this—the guy who comes out smelling like a rose (pauseWhite: laughs)—is T.D. Jakes. White: (laughs) T.D. Jakes. That’s true, that’s true. (laughs again) Yeah, you’re probably right. He’s—there’s no two ways about it. Even though, I would like to think that—on the positive level—people have been caused to think about modalism a little bit. It is discouraging (clears throat) to recognize that those who actually know modalism best have the quietest voices in this situation. And those—the loudest voices—in other words the biggest platforms, did not show themselves to be overly insightful as to—not only what modalism is—and how modalists speak, but making direct application to the Christian life, the Gospel—the reasons—the importance of why modalism totally undercuts the sacrificial work of Christ, and the worship of the Church, and all the rest of these things. There just doesn’t seem to have been—to be almost anybody—who has a really big platform that has brought that kind of thing to the fore. Now you had mentioned specifically though—a lot of people have mentioned to me—let’s put it this way, a lot of people had mentioned to me that they interpreted some of the things that were said in the interview—especially the first part of the interview—as being directed at pretty well-known individuals. That’s not really the case, is it? Baucham: No, I don’t think it was… What I am here to address—what I do think is absolutely crucial—is that the Body [of Christ] is being divided over this [race] issue. And the Body is being divided over a man [T.D. Jakes] who is one of the most poisonous influences in the [visible] church today. White: Now, you’ve been speaking about this for a long time. Help our listeners to understand. White: Why would you say something like that; because so many people look at him and they see success, they see—he’s been on the cover of Time magazine, for crying out loud. I’m—is Time still being published? It might be, I don’t know. (Baucham laughs) Who really knows anymore—but, you know, here’s the very picture of success and prominence and all the rest of this stuff, and yet here you’re talking about a “poisonous influence.” Why would that be? Baucham: Two things. One, the doctrine of the Trinity. And I don’t mean by that, that he’s influencing people because he’s out there teaching publicly on the Trinity. Baucham: There are clips of him, you know, teaching on the Trinity—but those things are few and far between. He’s smart enough to not build his empire on that issue. I mean, he knows that. He’s smart enough not to do that. You gotta go and search for those things that he’s taught on the Trinity. But [the issue's] his absolute perversion of the Gospel. The Word of Faith movement, the prosperity gospel, is a poison. It is a cancer. It is destroying people. It is absolutely destroying lives. It is another gospel. It is to be condemned. And it was not even addressed in this whole process. And [T.D. Jakes] is the chief purveyor. I mean, he is the godfather. Again, you know, there’s been a sort of meteoric rise of, you know, smilin’ Joel here in Houston. But T.D. Jakes—T.D. Jakes is the godfather as it relates to, you know, Word faith teachers, and so on and so forth. It breaks my heart that this is being allowed, and that he is basically given entre into whole nuther layer of evangelicalism.